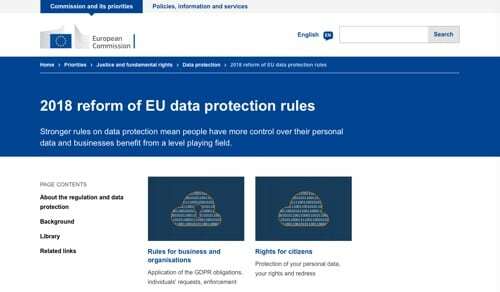 The General Data Protection Regulation is now in effect. For website owners worldwide, compliance with GDPR seems daunting. Luckily, there are plenty of resources to help. Here is a list of resources for businesses to become compliant with GDPR. There are official E.U. resources, helpful checklists, webinars, tracking sites, a WordPress plugin, and even a GDPR chatbot. All of these resources are free. European Commission: 2018 Reform of EU data protection rules. The European Commission is the executive body of the European Union. Get the official information of the GDPR reform, including rules for business and organizations, and the rights of citizens. Access the library of regulations and communication, and get a helpful list of related links. European Commission: 2018 Reform of EU Data Protection Rules. The GDPR Compliance Checklist is an interactive checklist made by a small team from Belgium to help businesses navigate the GDPR landscape. GDPR guide for designers. What does the GDPR require, and how will it reshape the work designers do? From Fast Company’s Co.Design, here is a GDPR guide for designers based on dialog with design agencies, data protection officers, and privacy advocates. Anonymizer. In the development process, you should never use a production database — it is risky and violates the GDPR. Anonymizer replaces all data in your database by anonymized random data. The most important feature of Anonymizer is data formatting. All generated data is similar to the original data used by real users. 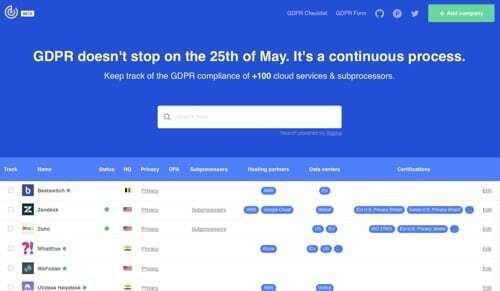 GDPR tracker is a compliance list for more than 100 cloud services and sub-processors. It includes hosting partners, data center locations, and certifications. Awesome GDPR is a curated list of GDPR-compliant tools for websites creators. Access search tools and apps that don’t track user data. “Parker,” data privacy chatbot. 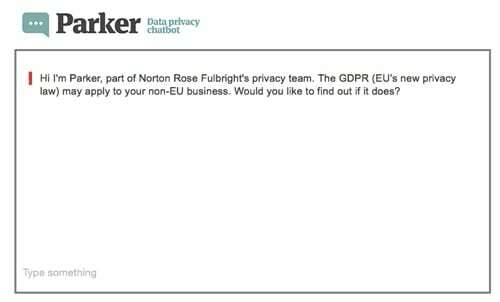 If you want to find out whether the GDPR may apply to your non-E.U. business, chat with “Parker,” the GDPR chatbot. Preparing for EU GDPR. From IT Governance Ltd, a U.K.-based risk management firm, this webinar provides an overview of the regulatory landscape, principles of the GDPR, breach notification rules, processor liabilities, and more. There’s also a recording of the webinar available on YouTube. EU GDPR: A Pocket Guide is an introduction for organizations that need to come to grips with the key principles of data privacy and the GDPR. GDPR WordPress plugin is meant to assist a controller, data processor, and data protection officer with efforts to meet the obligations and rights enacted under the GDPR. Add user consent management, cookie preferences, the ability to manage user data requests, and more. Achieving GDPR Compliance. This 5-minute video explains the core principles for GPDR, what it means for inbound and outbound marketing, and how to make web forms compliant. 10 ways to prepare your organization for GDPR is a helpful checklist of 10 simple steps organizations can take to make sure they’re compliant. EUGDPR.org portal. This website is a resource to educate the public about the main elements of the GDPR. It includes information on key regulation changes, controversial topics, article summaries, and more. The site was created by Trunomi (a data rights management company) and Commvault (a data recovery firm). ICO. The Information Commissioner’s Office is the U.K.’s independent body to uphold information rights. It published a comprehensive Guide to the General Data Protection Regulation, with extensive information on principles, law basis, rights, accountability, and more. 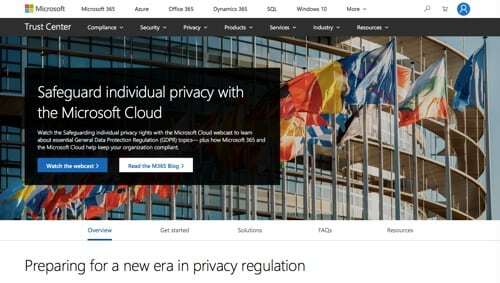 Microsoft Trust Center explains how Microsoft products help you comply with the GDPR. Access webinars, videos, white papers, and more. Learn about GDPR compliance best practices. Simplify your compliance process when using Microsoft cloud services with Compliance Manager. Assess your GDPR compliance with an interactive 10-question evaluation.